In the 3 years we have lived in our home the backyard has transformed from an empty greenspace into one of favorite places to spend time. We learned that it really doesn’t take much to get started. We began in the first summer with a rototiller borrowed from the inlaws and carved out a basic plot. 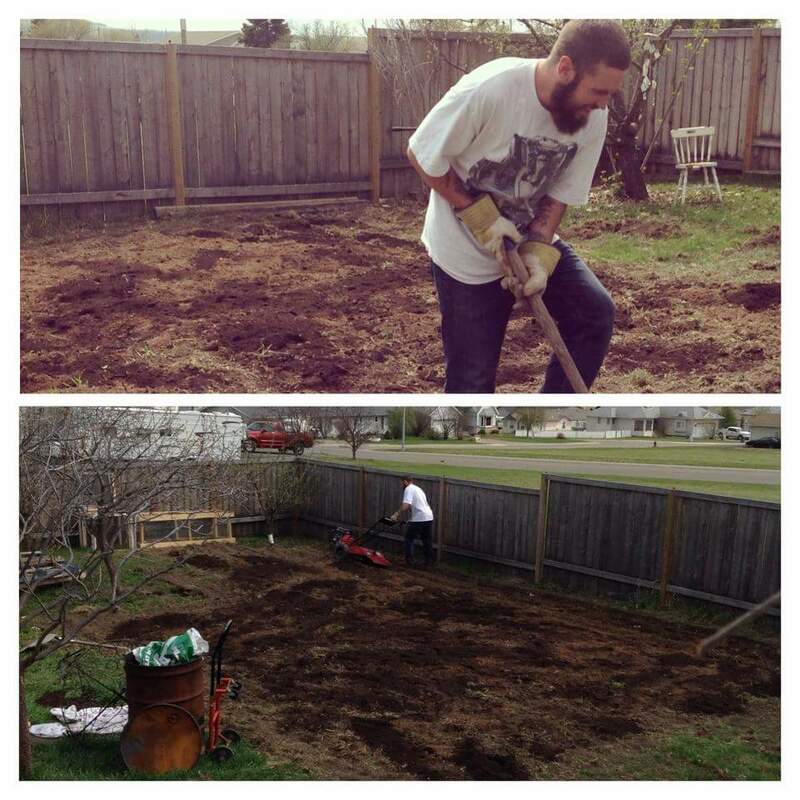 We planted directly into the dirt and focussed on getting the greenhouse up. 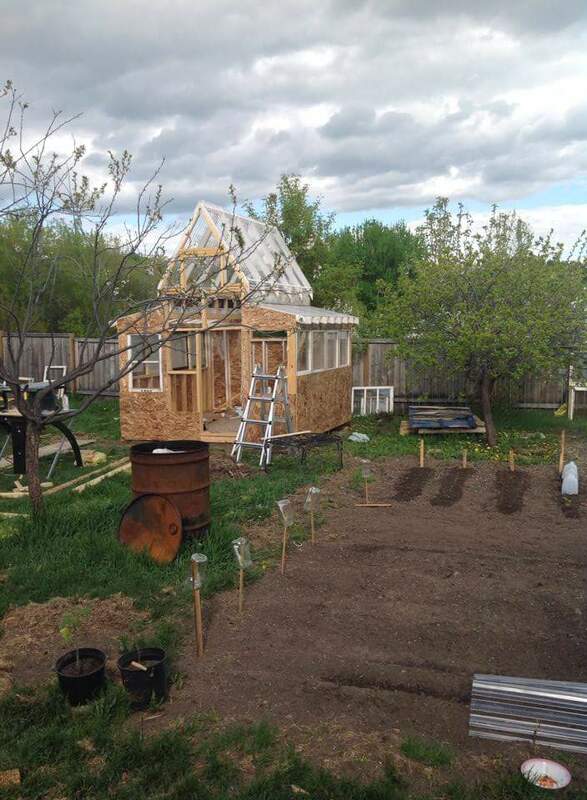 I broke down the construction of the greenhouse here. Over the summer I kept my eyes and ears open for good deals on wood and ended up scoring a full flat of j-grade 2x4s that had fallen off a loader at a local mill as well as a full fence that had been torn down and was offered to me for free. So I started using sunny afternoons to build garden boxes one by one and adding them to the plot, starting with the outer parameter boxes. 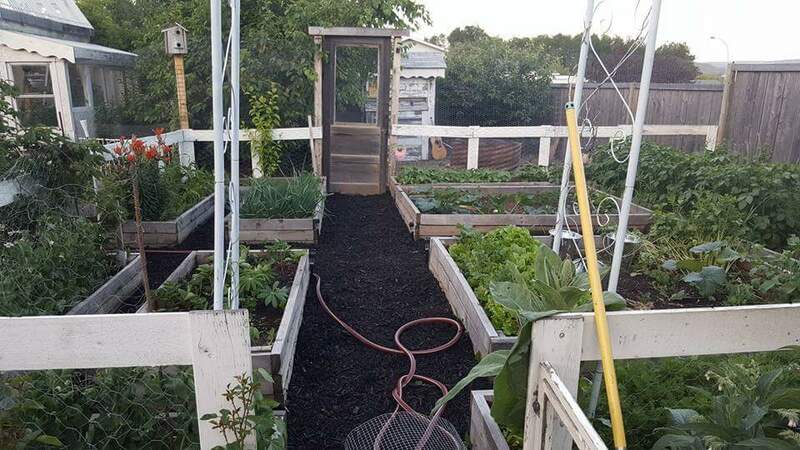 I kind of half-attempted a fence around the garden by screwing the boards into the sides of the outer boxes to keep the dog out. 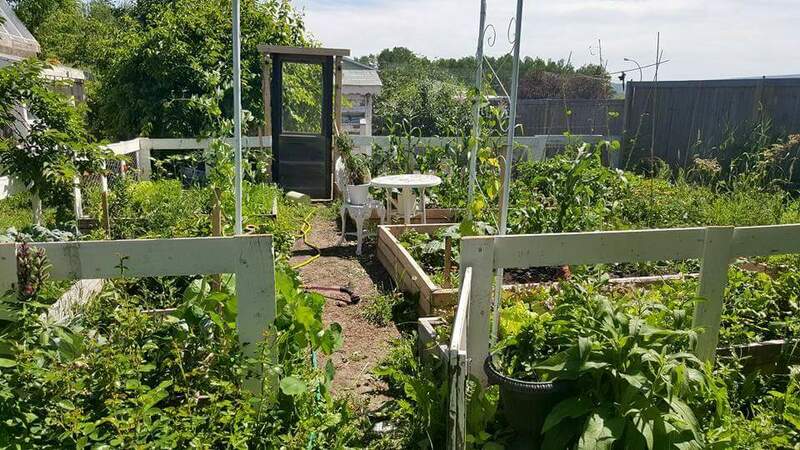 By the time next spring rolled around, I had completed all the boxes and refined the garden fence and was ready for a full season of planting. 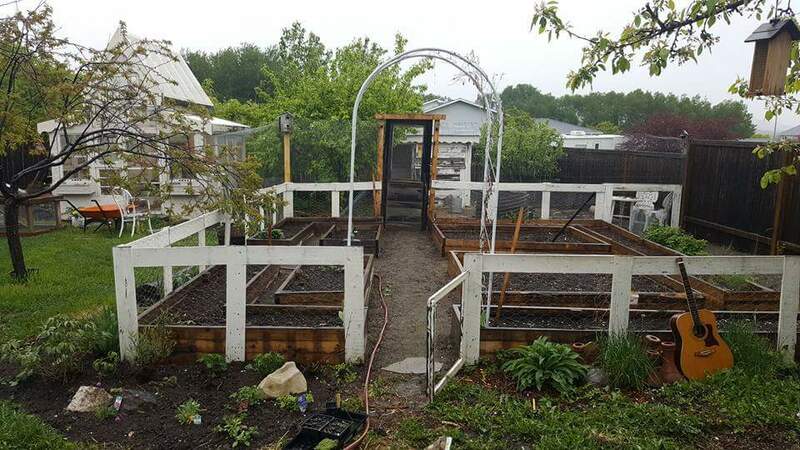 I had also rigged up an old door between two 4×4 posts to keep the chickens from infiltrating the garden. The whole chicken run area extends beneath the large fruit trees and to the back of the greenhouse. 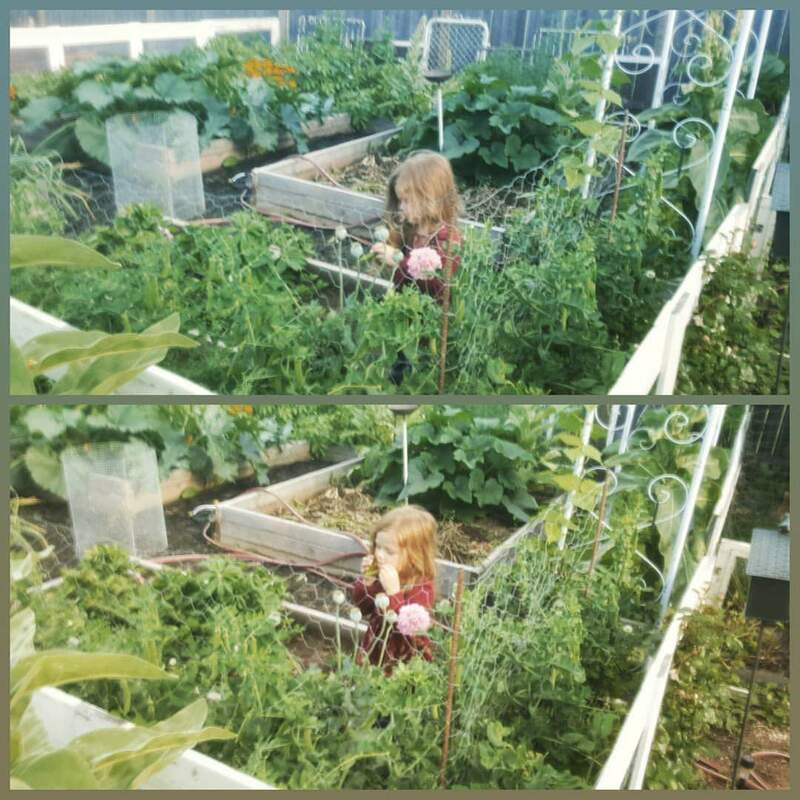 The chickens do a fine job keeping the weeds down and everything looking clean in that area and come fall I can release them full range to clean up the garden too. I bought some landscape fabric and laid it down in the paths, then covered with black mulch. In the spring of 2016 we had the strangest mosquito problem. Everyone in town hid indoors and our little community even adopted a municipal garlic-spray program to try to reduce the mosquito population. It.Was.Crazy. 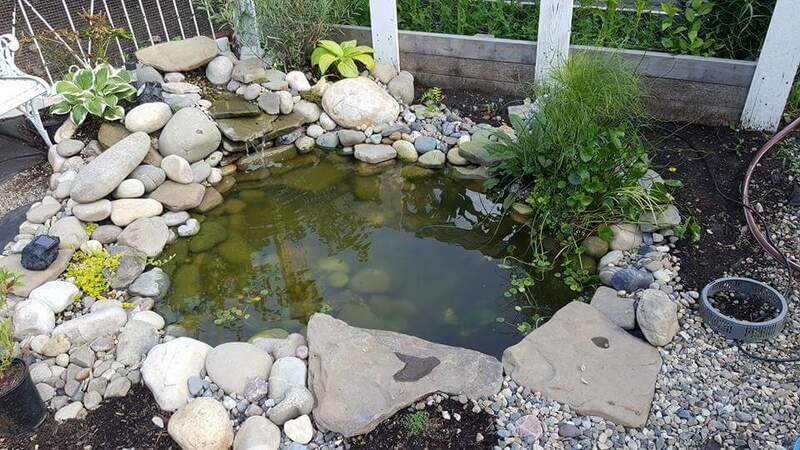 I wrote a post about how we helped solve that problem by building a pond which you can read more about here. I can’t tell you how amazing this pond has been in bringing diversity to our backyard. We have a constant supply of robins, finches, and all kinds of butterfly visitors to the pond daily. One time we even had a hawk swoop in and steal a goldfish! And the mosquito problem is no more. I keep dreaming of 2021 when we plan to start over on our foreverstead and i can take all I’ve learned and apply it to a brand new design. 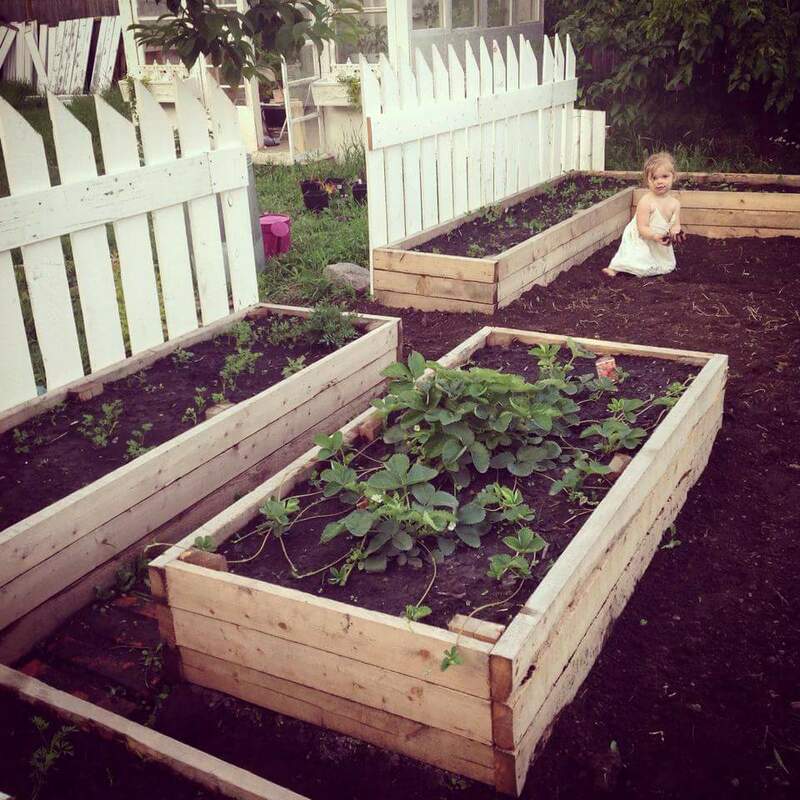 The work of building a garden is half the fun of having one! 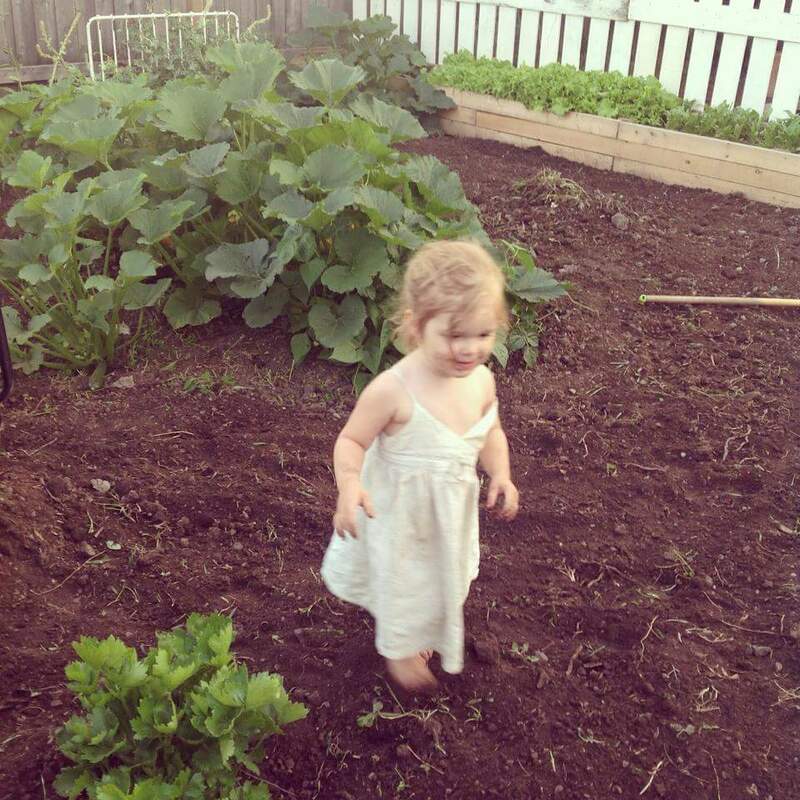 In the meantime we are having fun harvesting and enjoying fresh healthy snacks, salves, and serenity from the garden! There is nothing more rewarding the to see it grow,tend to it, harvest it and eat it ! I LOVE the idea of letting the chickens do the fall clean up. Damn girl. The worst part of gardening in my opinion is that clean up. Do you pull any of the plants or just send in the chickens? Isn’t it a lot of matter for them? It just occurred to me that maybe you could dehydrate some plants for chicken fees through the winter? I LOVE harvesting! I toss the stalks into the compost and let the chickens take care of the rest. For me, the worst part is finding the time to process it all before it goes bad! I am building a ginormous dehydrator this spring to make that part easier and totally plan to try dehydrating for dry soup mixes!